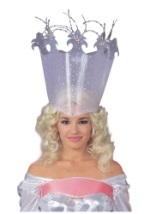 Complete Glinda's glittering look! The clear plastic footwear has a butterfly image sewn into the shoe and a 2ï¿½ translucent heel. The shoes also have a white faux leather interior. In addition, a solid black rubber sole helps prevent slipping. Spread goodwill and love this Halloween!